According to Student Loan Hero, about 1 out 8 divorcees queried in a recent survey said that the student loans they took out before getting married eventually led to their divorce. And the survey also found that more than a third of couples with student debt delayed their divorce because they couldn't afford the expense. Apparently, student loans are now such a significant marital problem that one New York attorney recommends couples sign a prenuptial agreement specifying that the person helping to pay off the spouse's student loans gets reimbursed in case of a divorce. How romantic! Experts have long agreed that money problems put a strain on marriages, but student loans are a particularly nasty form of debt. No wonder so many divorcees cited student loans specifically as a major cause of their marital split. Unlike car loans, credit card debt and home mortgages, student-loan debt is almost impossible to discharge in bankruptcy. Moreover, student-loan borrowers have huge penalties slapped on their college-loan debt if they default--25 percent of the amount owed, including unpaid interest. The Student Loan Hero survey is only the most recent evidence of the pain Americans are suffering from student loans. Earlier this month, the New York Times reported that Americans are having fewer babies; and college loans are one of the reasons. The Times conducted a survey of men and women in the 20-to-45 age group, and almost two thirds said they planned to have fewer children than their ideal because of financial concerns. Among people who said they planned to have no children, 13 percent cited student debt. And the Federal Reserve Bank of New York documented last year that student debt was negatively affecting the housing market. A 2017 Federal Reserve Bank report observed that home ownership among young people declined by 8 percent over an 8-year period (2007 to 2015); and the Feds concluded that a substantial reason for this decline is rising levels of student-loan debt. None of this bad news should be surprising as Americans borrow more and more money to go to college. In 2002, only 20 percent of student borrowers owed $20,000 or more. Last year, 40 percent of student debtors owed that much or more. And borrowers owing $50,000 or more jumped from 5 percent to 16 percent during the same time period. Remarkably, almost no one in the higher education industry even acknowledges a problem with soaring student-loan debt. If there is a problem, the industry flacks tell us, the easy solution is extended repayment terms. Simply force Americans to pay back their loans over 20 years or even 25 years, university insiders insist. Do you suppose Betsy DeVos thinks about distressed student borrowers when she sips her martinis on her $40 million yacht, the Seaquest? I doubt it. Based on the way she's running the Department of Education, my guess is that she worries more about protecting the predatory for-profit colleges than the students who got swindled by them. And who do you suppose Betsy is more likely to invite for drinks on the Seaquest--a single mom who defaulted on a loan she took out to attend the University of Phoenix or an equity-fund manager who owns part of the University of Phoenix? Betsy DeVos's $40 million yacht--193 feet long! Moriah Balingit. 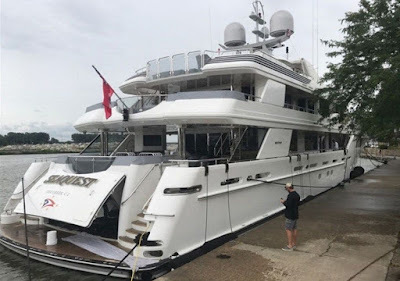 Someone untied Betsy DeVos's yacht in Ohio. Damage Ensued. Washington Post, July 26, 2018. Jessica Dickler. 1 in 8 divorces is caused by student loans. CNBC.com., July 27, 2018. Ben Luthi. Survey: Student Loan Borrowers Wait Longer and Pay More to Get Divorced. Student Debt Hero, July 24, 2018. Claire Cain Miller. Americans Are Having Fewer Babies. They Told Us Why. New York Times, July 5, 2018. Rick Seltzer. Percentage of Borrowers Owing $20,000 or More Doubled Since 2002. Inside Higher Ed, August 17, 2017. Steve Rhode. Student Loan Debt Hurts Economy, Consumers, and Retirement Savings. Personal Finance Syndication Network, September 2017.